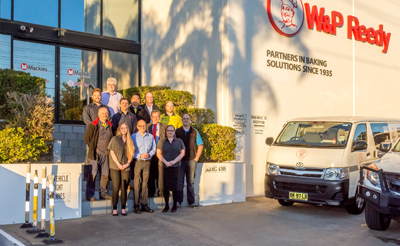 Welcome to W & P Reedy! We are importers and exporters of quality equipment and are well respected by our competitors and customers. We cater mainly for Bakers and Pastrycooks but also supply Hotels, Motels, Restaurants and Pizza shops. We have a full range of baking machinery and are always ready to accept a challenge should a request be made for any unusual or non standard items. Our service department is on hand 24 hours a day, 7 days a week. They have a thorough knowledge and understanding of baking, associated machinery and carry a full range of spare parts. At our Sydney showroom we display utensils, tins, trays, display racks and equipment right through to Double Rack ovens. We have most items from our catalogue as well as many others in stock. Our company aim is to provide 100% customer satisfaction.